Changing fuels for combination oil and gas fired units is achieved by turning a selector switch mounted on the control cabinet. It is not necessary to change any burner components in order to change from one fuel to another. The small volume of water contained in the coils allows the unit to achieve rated output in approximately five minutes from a cold start as opposed to firetube boilers, which may take up to an hour or longer. The physical size of Vapor watertube boilers holds prepurge energy losses to a minimum. Prepurge is required to insure that all combustible gases that may remain from previous firings are removed prior to ignition. Prepurge also cools warm interior surfaces. This energy is lost out the stack during prepurge. Vapor’s physical size allows proper prepurge in a matter of seconds, which holds prepurge energy losses to a minimum. Vapor’s burner control, coupled with the small water volume of the coils, allows for quick response to load changes. Vapor units have a cycle time of less than one minute from a load satisfied/burner off condition to demand/burner on at high fire condition. Vapor units offer “full modulation” with turndown ratios of up to 10 to 1. These high turndown ratios (maximum output to minimum output) allow a wide range of loads to be handled without excessive on-off cycling at low load conditions. Vapor watertube steam generators are more compact and weigh less than firetube boilers of the same horsepower. This size and weight differential saves both floor space and installation costs for new construction and frequently avoids the need to tear down and rebuild walls for retrofit and replacement jobs. When comparing our units with our competitors’ similar units you will notice that our unit will weigh more. Part of the reason for this can be found in our coil design. The coils for our 300 psi design Modulatics are actually designed for 1,000 psi and 750° F and hydrotested to 1,500 psi. The coils for our 150 psi design Circulatics are actually designed for 1,275 psi and 750° F and are hydrotested at 1,915 psi. Although many people consider this over-design, Vapor feels that the increased coil thickness leads to much longer life and consequently less repair work in the field. While other manufacturers have one coil in their unit, Vapor uses multiple coils (up to four coils in the Modulatic and seven coils in the Circulatic). When there is a damaged monotube coil, the entire coil has to be completely replaced. In our multiple coil design only the damaged coil needs to be replaced. This substantially reduces coil replacement costs. The Vapor steam generator’s burners are located on top in the Modulatic (vertical unit) and the end in the Circulatic (horizontal unit). In both cases it is easier to see and work on our burner than it is on a burner underneath the unit. Vapor steam generators are available in standard sizes from 18 BHP to 600 BHP and pressures up to 3,200 psig. Vapor also has a complete range of superheaters with up to 7,500,000 Btu/hr capability, temperatures to 1250° F and pressures up to 3,200 psig. 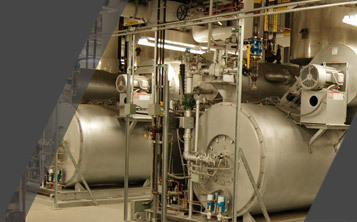 Combination steam generator/superheater packages are also available.